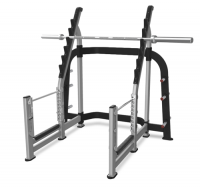 Adjustable bar catches, Adjustable safety bar supports, Walk through front design allows for use of multiple benches, Complete Olympic plate storage, Integrated multi grip pull up station, 900 lb max load capacity. 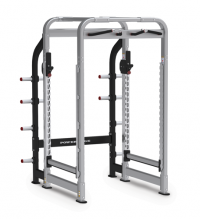 The Half Rack is everything you need for functional training and smart storage. Laser cut numbers and plastic liners on the bar storage give it the competitive edge. The wide open design of the Annexed Half Rack System by Freemotion opens up new training opportunities and keeps your facility organized. With two barbell storage areas and four receptacles, this piece creates training opportunities and storage you never thought possible. Looks and brains in one hardworking machine, the Freemotion Double Half Rack is where weight training and superior organization come together. 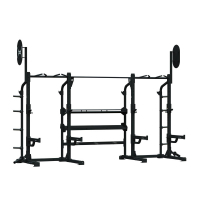 Built with 7-gauge steel and in a variety of custom colors, the Freemotion Double Half Rack is is sharp-looking and hard working with ample storage and workout stations for one-on-one or small group training. Contrasting colors and functional design are two reasons why the Freemotion Pro Half Rack is in a class of its own. Quad bar storage and 12 long pegs add to its versatility. Ball grips on the multi chin and neutral grip bar expand your training space that infuses excitement onto the floor. Get a chin up, a leg up and a bar up on your competition with the Freemotion Pro Power Rack. An eye-catching design with extreme versatility creates the ultimate training ground for personal training sessions or small groups. Customized with 2 in (5 cm) adjustments, this rack features longer than normal pegs, quad bar storage and tougher-than-nails 7 gauge steel. 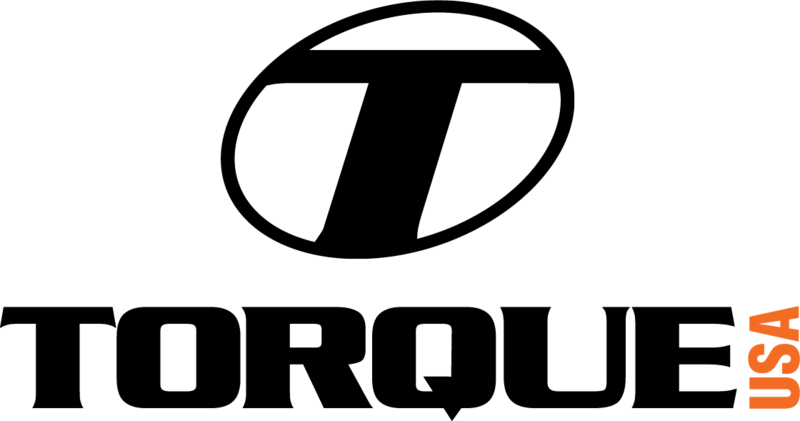 Regular Price: Call For Special Pricing! Special Price Call For Special Pricing! Safety Catch Bars: Solid steel, chrome plated catch bars adjust in height to allow full range of motion and safely contain a dropped bar. Multiple Bar Racks: Six rack heights allow for maximum bar clearance and extend width for wide hand positioning. Bolt-down Holes: For added safety, pieces can be bolted to the floor through predrilled holes. Kick Plates: Made of 16-gauge, stainless steel, kick plates protect equipment for long-life and durability. Power Cage - X1 PACKAGE expands the functional training capabilities of the XPC by including front upright mounted resistance band anchors, a ground rotational trainer, and a ball target.